This week marks the first full week of teaching in the spring semester. I should get a better sense of how busy I will be. Since finishing my Christmas knitting, I have been working on new projects, I just have not shared them here. My in-laws gave me a gift certificate to a yarn shop in Springfield, MO. I did not have a specific idea of what I wanted to buy, but I knew that I wanted to try a new yarn. When browsing the store, I kept coming back to this brilliant blue yarn (Nashua Creative Focus Handknit Worsted). So I decided it must come home with me. 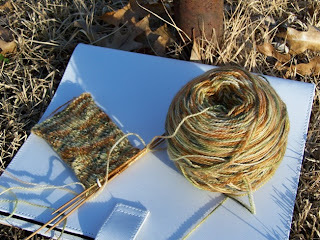 I have been wanting to knit some hats and have very little worsted weight yarn right now. In the end I paired it up with Natural and a deep chocolate brown called Espresso. I have also been itching to do some color-work. 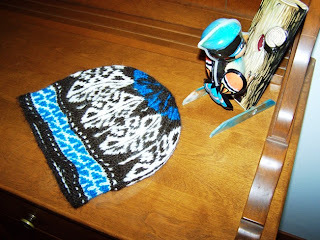 The pattern is from Anna Zilboorg's hat book (the name escapes me right now) which I borrowed from the library. I made "Onion Dome" #2. After a Saturday morning filled with knitting, a finished hat. The photo is not all that great, there are only three colors. This photos makes it look like there is a light blue as well. My gauge was a bit off - more stitches per inch than called for, so I don't have the nice onion dome shape as in the book. But it fits my head and I really love it. My husband thinks the motifs look like insects - thus the name. 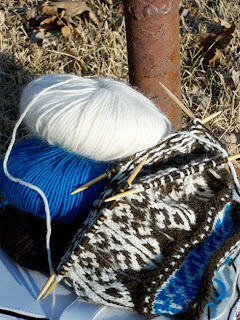 I am currently knitting a second hat from the same book with the same yarn - one of the toques. This time at the correct gauge. I also started a new pair of socks - Ripple Weave Socks by Charlene Schurch from the Fall 06 issue of Vogue Knitting. So far, this pattern has taken a lot of attention and I have not gotten to the point where I can not look at the chart. But I am pleased with how it is going. 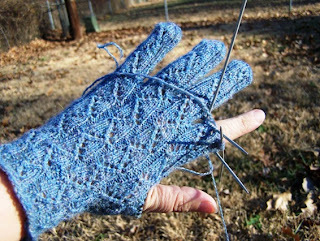 I also started a pair of gloves - from A Gathering of Lace. 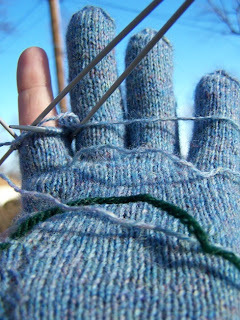 I am really excited to have a new pair of gloves, I am less excited by knitting the fingers. Boy my thumb looks wrinkly. I do think it is cool how the fingers become part of the whole. And I enjoy looking at the palm side as much as the back side of these gloves. I still need to work on picking up the finger stitches and creating a tighter join. Am I being overly ambitious?